What once seemed impossible is set to be a reality in the not-so-distant future: astronauts will walk on Mars. Through her research on somatosensory experiences and proprioception, PhD candidate Ashleigh Marchant is helping astronauts prepare for some of the health issues they may face when they get there. 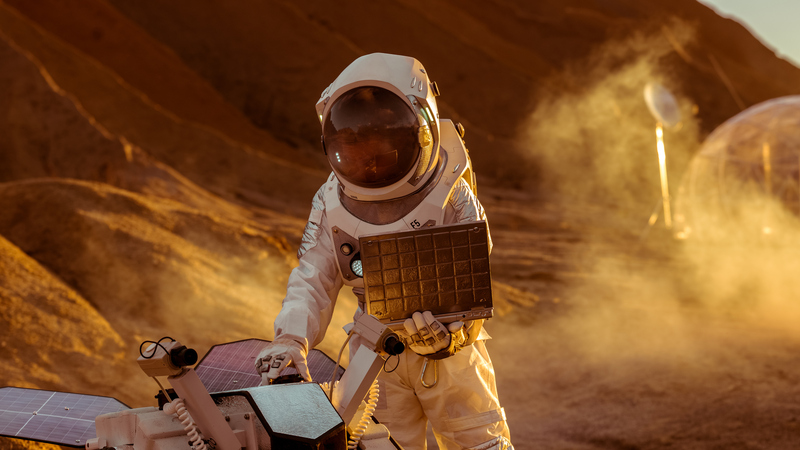 When astronauts land on Mars, they will face a range of challenges – from dealing with an unknown environment to the psychological effects of long-term isolation. However, there are also concerns that they may not even be able to set foot on the red planet, due to the loss of proprioception or the sense of movement. Researchers at the University of Canberra, including PhD candidate Ashleigh Marchant, are working alongside the National Aeronautics and Space Administration (NASA) to help mitigate this issue. "When astronauts go into space they don’t have that vertical orientation or gravity pulling on their body, and they’re also disoriented. This is the closest we can get to simulation of micro-gravity without actually sending someone up into space," Ashleigh said. "After my undergraduate degree in Physiotherapy I applied for the Honours, program not really knowing what I wanted to do. The results from my Honours showed that there was some sort of deficit when lying down in pretend micro-gravity, which opened up a whole range of other questions. "As a result, my PhD builds on my Honours research and looks at what level of deterioration is occurring. We’re also playing around with proprioception, both upright, and lying down to mimic [being on] the Moon and Mars." By measuring proprioception through testing a person’s ability to perceive slight changes in movement, Ashleigh’s research contributes directly towards NASA’s goal of reaching Mars. "If astronauts make it to Mars, when they disembark from the spaceship, even if their bones and muscles are at full performance levels, their proprioception will be lacking, which will result in them falling over, so we want to try and help them reorient themselves," she said. After a chance meeting with Ashleigh’s supervisor, Professor of Sports Medicine Gordon Waddington, NASA sought to partner with UC based on its advanced work on proprioception. "As you can imagine, NASA has done a lot of research into how the body is affected when astronauts enter zero-gravity, but there is not a great deal specifically on proprioception," Ashleigh said. It is a vital element to understanding how astronauts will be able to walk on Mars, but it doesn’t really get researched because it is so difficult to measure accurately. "We have a device that Gordon made a number of years ago, AMeDA – or the Active Movement extent Discrimination Apparatus, that records proprioception, and that’s instrumental to this research," she said. Developed in Canberra, the AMeDA has also been installed at the Johnson Space Center in Houston, Texas, where astronauts are trained. "Straight out of school, I studied civil engineering and I finished the course and went on to work. I realised though that I wanted to be doing something that involved people and was a bit more active,’ she said. Apart from the opportunity to work with people, a big motivator for Ashleigh is being able to make a difference through her research. "This research is really important for physiotherapy because we generally measure proprioception lying down, simply because it’s easier. That recording may not necessarily be accurate though," continued Ashleigh. "If we do a combination with upright and weight-bearing tests, we can get a more reliable result for measuring proprioception, which will help us perform better in our jobs as physiotherapists." This technology is also being used for research which investigates how sports-related injuries and concussions impact a person’s proprioception. Created by two University of Canberra PhD students, the Equilibri Balance Ball is set to be a fantastic solution to reducing falls in the balance-impaired. Teachers are the catalysts for change. They stimulate minds, trigger innovative thinking and promote creativity. All essential components for adapting to a continually evolving world.